From the kitchen of One Perfect Bite...Fasten your seat belts folks,'cause you're in for a bumpy ride. Today we are exploring the work and influence of Ella Brennan, a restaurateur who holds position 34 on the Gourmet Live list of Women Game Changers in food. She is a fascinating woman whose zest for life, devotion to family and studied knowledge of the restaurant business has given her legendary status in the culinary world. She is off-beat, edgy and a bit eccentric, one of those rare individuals who add a splash of vibrant red to a world that is too often gray. To know her, you must understand where she came from and a bit about her family. She was born in the Irish Channel, a neighborhood in New Orleans, to a family of three boys and three girls. Her father was a handsome raconteur and her mother, a gifted cook, loved to entertain. It was, however, her brother Owen who drew her to the restaurant world. While she was in high school, he bought a restaurant in the French Quarter called the Vieux Carre. Apparently, even as a young woman, she had an intuitive sense of the business, and she was unrelenting in her criticism of his venture. It was a bit more than the classic thrust and parry of siblings. He challenged her to improve what she saw. She accepted. Though she was still in high school, she ended up doing whatever he didn't like to do. That included the hiring and training of staff, menu planning, bookkeeping and inventory control. She was keenly aware of her inexperience, so she turned to books to learn each skill she needed to operate the restaurant. Then she turned to people she thought might have something more to teach her. She spent hours talking to diners, food and wine merchants and the kitchen staff. By the time she was 18, she was running the place and it became an enterprise that employed the entire family, save for her gentile mother, who refused to work in the French Quarter. The hours were long and arduous and she never, at any point in her career, stopped working. Today, she is the matriarch of a New Orleans family that operates a dozen restaurants, including the Commander's Palace, her baby. Though she is retired, she lives next door to the restaurant which is now run by her daughter, Ti. Word on the street says she finds it hard to stay away and visits the kitchen several times aweek. We are told she is still irreverent, wildly entertaining and has retained the curious mix of elegance and earthiness that has always been her hallmark. She remains a serious student of all that interests her. Ruth Reich credits her with defining a new type of restaurant that is distinctly American and celebrates the regional food of this country. She is credited with pioneering the notion of nouvelle Creole cuisine, elevating the profile of Louisiana cooking throughout the world and in doing so earning for herself a place in the culinary history of the nation. Ella Brennan is a fascinating woman who has rubbed elbows with princes and paupers and trained chefs who changed the way America eats. If you'd like to know more about this unconventional woman and her family, you'll find a quick and insightful read, here. Now comes the tricky part. By her own admission Ella Brennan, who has a golden palate, "can't cook worth a lick" and drolly suggests, "I never took to the kitchen." That means that those of us who want to feature recipes that highlight the food for which she is famous have to scratch like hens in dirt to find them. When I saw this one, I knew I'd have to give it a try. I don't know a lot about this type of dish, so if I misrepresent it in any way, please forgive my ignorance. I served these catfish morsels as finger food on game day. I suppose they could be served as an entree, but I was concerned that that a meal-size portion would be too high in calories to be acceptable to many of you. These are very nice, but when I make them again I'll use half the mustard called for in the recipe. I found it to be too intense in flavor for my palate and will use mayonnaise to replace some of it next time around. This is a nice recipe and I know that those of you who try it will enjoy the catfish fingers. 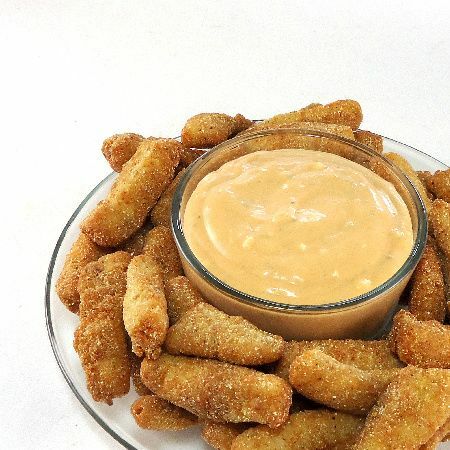 The dipping sauce, actually a tomato remoulade, is really, really good and would also be wonderful with chicken fingers or used to dress a salad. Here is Ella's recipe. 1) Combine tomato purée, wine, tomato juice, and garlic in a small sauce-pan and bring quickly to a boil, stirring, over high heat. Turn the heat down to a simmer and reduce the mixture to 1 cup without stirring, about 20 to 25 minutes. Allow to cool. Add cooled tomato reduction to mayonnaise, onion, and relish in a food processor. Purée mixture and scrape it out into a bowl. Mix in all other ingredients, correct seasoning if necessary, and chill. Makes about 3 cups. 2) Cut catfish into 1/2-by-2-inch strips. Combine mustard, wine, salt and pepper. Add catfish strips and toss to coat well. Cover and marinate for an hour. 3) Heat oil in a deep fryer to 350 degrees F. Mix together cornmeal, corn flour, cornstarch and Creole seasoning. Spread out on a sheet of waxed paper. Roll marinated strips in mixture, lightly shaking off any excess. Fry until golden, about 4 minutes. Drain on paper towels and serve with Tomato Tartar Sauce. The following bloggers are also featuring the recipes of Ella Brennan today. I hope you'll pay them all a visit. They are great cooks who have wonderful blogs. Next week we will highlight the career and recipes of Delia Smith. It will be really interesting to see what everyone comes up with. If you'd like to join us please email me for additional information no later than Monday, February 13th. you're tomato tartar sauce looks so delicious. What an interesting woman and as a catfish lover,I will definitely have to try these. Thanks for the tip about the mustard. We both made the same recipe and yet with our own style Mary. I love the idea of serving these as finger food. It was my first taste of catfish and perhaps not my last. That sauce is really interesting, we eat so much fish here, (but not much catfish, I'm afraid) and I know I can find a million uses for it. Great bio of Ella. I want to try this sauce just because it sounds so different. I really love the sound of these catfish fingers and know my son would be pleased as all get out if I made some soon. I think Miss Ella is one of the most fascinating ladies on the list. I love New Orleans food and have the original Brennan's cookbook with the red rooster on the cover. Catfish fingers are quintessentially southern and I know Miss Ella would approve, especially since you've served them with a tomato tartar remoulade sauce. Great series Mary. Thanks for thinking of it. I'm enjoying it very much. Wasn't she fun? And I adore the tartar sauce! What an interesting woman Ella is. I had no idea!! Love this recipe.. especially the tartar sauce - can't wait to try that one!! Very interesting recipe!Thanks for sharing,dear Mary!Have a lovely weekend! Nothing beats catfish in New Orleans; I would love to go back. I never see catfish around here, but will try that sauce. wow, she is an aspiring lady! you did her justice with this recipe! For years, the Vieux Carre was my parent's favorite restaurant. They had a ritual of eating there every year as they visited the Crescent City. Great story. And those fingers look divine. I love spicy food and hot mustard is super. Who cares if she can't cook... she sure knows how to direct! How interesting for one to be so successful in a position, especially when one does not cook. What a fun loving family! I really enjoyed reading about them and looking over a lot of the recipe. I'm sure those catfish fingers must have been very tasty. I'm enjoying connecting with Ella Brennan through my favorite blogs. Armed with this information, I look forward to my next culinary visit to New Orleans. My sweet southern mother would not touch catfish (bottom feeders was her reasoning) but we like them and your recipe looks delicious. Have a great weekend. Looks like we'll be shoveling snow!! I love learning about the people and the personalities of all these woman that I have never heard before. I've never seen tomato tartar sauce, but it looks soooo delicious, that I'm gonna make it by my own as soon as I can :) Blessings! What a wonderful recipe Mary. I cant wait to try it. This will be wonderful for Lent. Thanks for sharing with us. This is definitely game day food, if ever I've seen it! But I think that tartar sauce might steal the show. I'm a huge mustard lover - and I am awaiting the return of catfish to our stores to have these. I love that she developed recipes with others - she was (is!) very shrewd. Don't you want to have a drink with her? What a delightful story! My mother makes the best catfish ever, so crisp and fresh, never greasy. I love reading stories about other "self-made" people. My mother never went to college but she ran my father's business very successfully for over 25 years. I'm not a big fish-eater, Mary, but these fish fingers and that delicious tomato tartar sauce are already sounding very appealing to me! :D I might have to try it, even if it's just for the tartar sauce! I love catfish! I will definitely give this a try! Absolutely gorgeous, crispy fish fingers... Love fish fingers and so does my little girl... The sauce sounds really yummy too! Thanks for sharing this recipe, Mary! Dear Mary, This is a wonderful version of the old fashioned fish sticks I remember from my childhood. These sound great!! I love the dipping sauce to go with it. I am so glad you made these, I saw this recipe and wondered how it was. This looks so nice and flakey and the tarter sauce sounds wonderful. I cannot think of fried catfish without thinking of my grandfather who loved a good fish fry! I bet he'd have snatched that sauce right upto have with his catfish! Great post, Mary! I'm sorry that I was so late posting mine ... better late than never, though!